After some time I have finally managed to sit down with my clock kit and make an attempt at putting it together. Full disclosure: I am not a tech expert by any means and am totally on a diy learning curve. Having said that, I have questions about this kit. Or in other words, could someone help me check my work? I have not successfully gotten it to display anything when it's plugged in and I don't know what's going on. (I think they're transistors) - I soldered one of the three pronged "almost circle" things facing the wrong direction on the pcb. The flat part of the circle is not at the flat part of the line on the pcb. Will this cause the clock to not work? I have parts left over and don't know what to do with them. 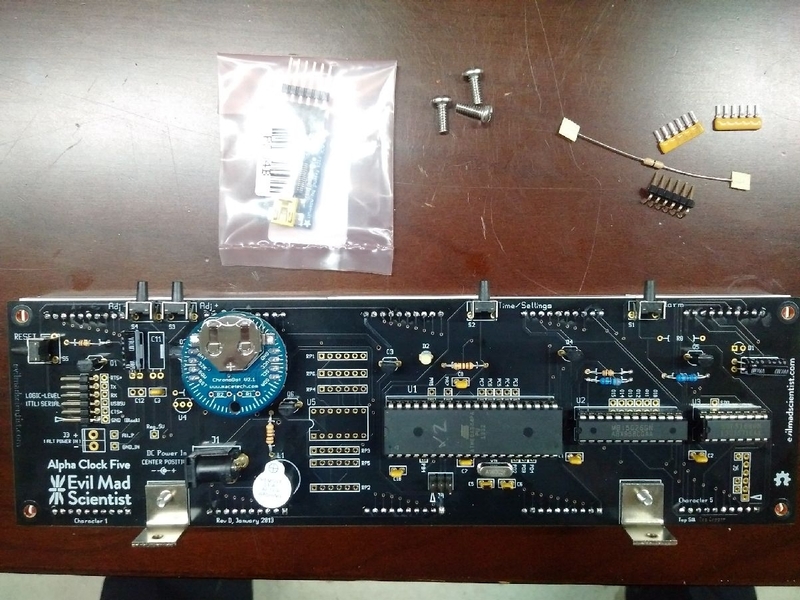 The parts list is not accurate according to my pcb and the picture in the assembly instructions online show a different board than the one I have. (REV D) What should I do? Or, where do these parts go? It looks like I'm missing parts. On the pcb next to the 24 pin chip socket (on the left) there's an empty 14 holes which looks like another chip is supposed to go there. I have a 24, 16, and 8 pin chip put in but there's a whole column of holes in the middle of the board for components that I don't have. Am I missing parts? It just seems like there's a lot of empty slots left. Does it matter which direction the stripes on the resistors face when they're installed? I didn't think about this when soldering them in and they are not all facing the same direction. Lastly (I think / hope) Where does the FTDI Friend chip go? I think I installed the part that goes where this is supposed to go but I'm not sure. Please help, I have attached a picture if that helps. All the parts I have are in the picture. I also apologize for the glare. The makerspace's fluorescent lighting can be unforgiving at times. First, yes, we can help you get it to work. You have a lot of questions here, so I'll try to take them (more or less) one at a time. I can see why it isn't working, but please do not plug it into power again until you've both fixed what's wrong and read carefully through the assembly instructions to double check your work. There may be other things wrong that are fixable at this point, but could lead to damage if plugged in that way. I'm guessing that this is an Alpha Clock Five Red kit, but you haven't said so. If it is an Alpha Clock Five kit in red (not blue or white), then yes, (as it says in step 21) all of the little half-round things are transistors. As it says in the instructions, you do need to match them to their outlines on the board. I can't tell from the photo which is backwards, but if one is backwards, then it will (at a minimum) cause one character of the display to not light. You must repair this before applying power to the clock. Can you please say exactly what you mean? If there are errors in the instructions or parts list we would definitely like to know about them. Note on PCB version This PCB is rev D, which replaces rev. C in version 2.0 kits. In assembly step 3, just pretend that it says "rev C". What should I do? Or, where do these parts go? Please follow the instructions, step by step, and do what they say. If you do so, you'll find that there are clear, picture-heavy descriptions of where to put each part, including the parts that you haven't installed yet. If you go ahead and follow the assembly instructions, you'll even find that one of the steps lists exactly which slots will be left empty when you're done assembling the kit. No, as it says in the instructions, resistors can go in either way. Lastly (I think / hope) Where does the FTDI Friend chip go? It doesn't get soldered in; it only connects by that six pin connector. Follow the picture in the instructions, with one caveat. The instructions show it connected with FTDI cable version, rather than the FTDI Friend. Where the cable has black and green wires, the FTDI Friend has labeled "black" and "green" ends so that you can tell the orientation. Thanks for the quick and very nice response. This helps a lot and is very reassuring. I'm just messaging now to say that I will be away from the makerspace's tech lab for a couple days and I'll get back to you as soon as I can.